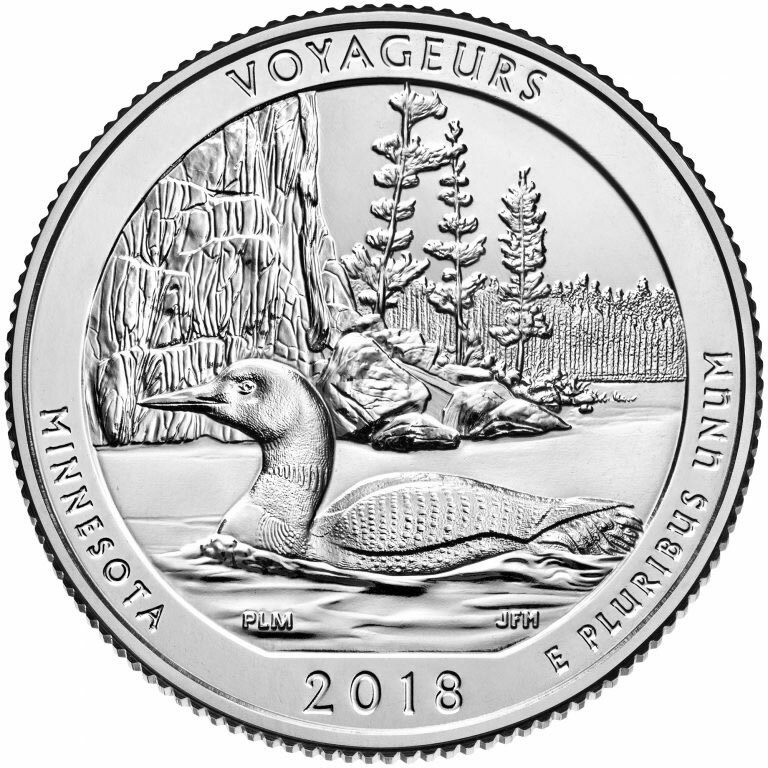 The third of the five 2018-dated U.S. quarters honors Voyageurs National Park in Minnesota. This strike also marks the forty-third release overall in the United States Mint’s coin series, dubbed the America the Beautiful Quarters® Program, which will commemorate a combined fifty-six national sites by its completion in 2021. U.S. Mint-hosted coin forums offer an opportunity to learn about current and upcoming coins. The coin exchange gives the public a chance to swap cash for $10 rolls of new quarters. It is usually difficult to find new quarters, sometimes taking months to years for them to appear regularly in change. Easier methods of getting them include coin exchanges and buying them straight from the U.S. Mint (www.usmint.gov). Five candidate designs for the quarter were developed by the U.S. Mint in consultation with representatives of the national park. The Treasury Secretary selected the winning design after the Commission of Fine Arts and the Citizens Coinage Advisory Committee reviewed them. Created by Patricia Morris and sculpted by Joseph Menna, the design depicts a common loon with a rock cliff in the background. 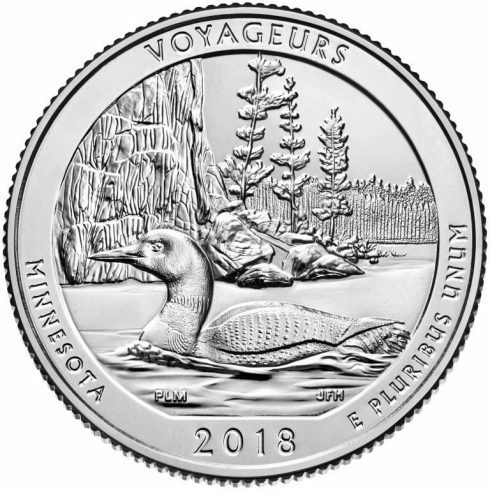 Around the scene are inscriptions "VOYAGEURS," "MINNESOTA," "2018" and "E PLURIBUS UNUM." The pair of obverse and reverse designs will also appear on a series of U.S. Mint bullion and collector 3-inch diameter, 5-ounce America the Beautiful silver coins. Congress authorized the 56-quarter series with the passage of the America’s Beautiful National Parks Quarter Dollar Coin Act of 2008, which became Public Law 110-456. Under the Act, new quarter dollars started appearing in 2010 immediately following the D.C. & U.S. Territories quarter series which, itself, followed the 50-State Quarter series. All three programs were and are operated similar to each other. For example, for the America the Beautiful series, five new quarter designs are released annually — the same format that the original 50-State Quarter series followed. Voyageurs National Park of Minnesota was initially established on April 8, 1975 and is found in the northern part of the state near the town of International Falls. It takes its name from the French-Canadian fur traders who are believed to be the first European settlers to visit the area and were known as voyageurs. The park receives only slightly more than 200,000 visitors annually, but that is actually quite a respectable number owing to several factors. Among these is its remote location far from large population bases and out of the way of any major travel destinations. Second, while there are a few visitor centers around the periphery of the park, most of its services are accessible only by boat during the summer or by snowmobile, ski or snowshoe in the winter.